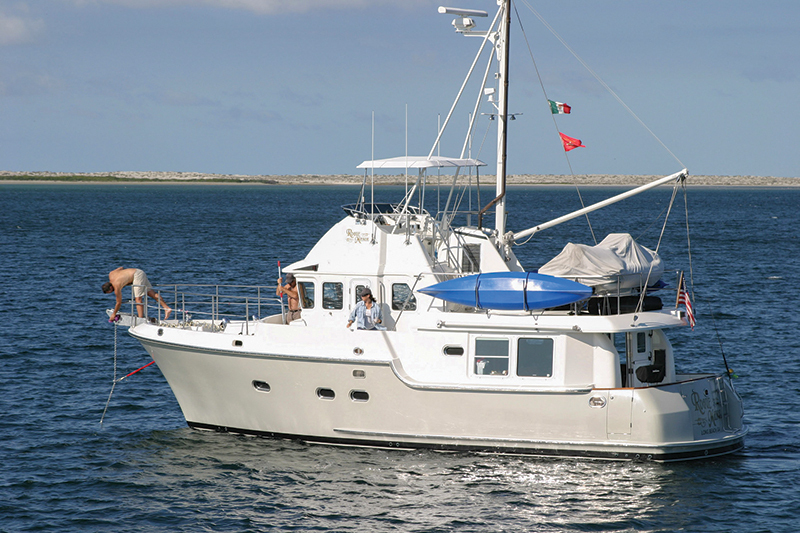 Boaters heading to Mexico for the winter should embark on a practice cruise with a couple of overnight runs. 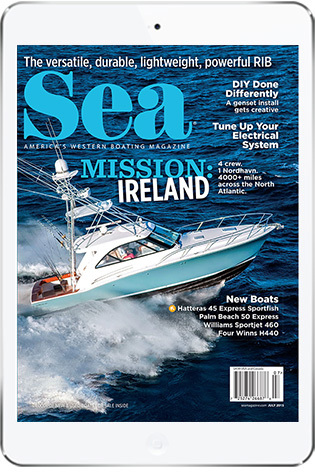 This month, several thousands West Coast boaters are preparing to head south into Mexican waters. If this includes you but your To-Do list isn’t complete and your boat is disheveled, it might be time for a nice little shakedown cruise. I suggest a simple voyage in local waters, but it should include two overnighters. 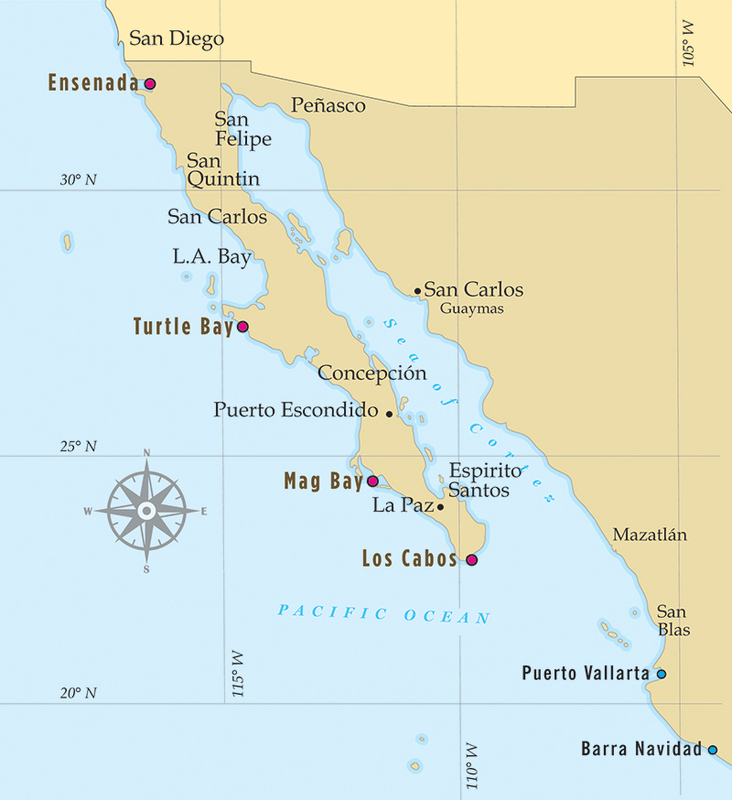 Some first-timers don’t know that the Pacific side of Baja contains three unavoidable stretches without reliable places to stop for the night. (See sidebar.) For safety’s sake, you should get comfortable making overnight runs between fuel and rest stops. Here’s one plan that shakes down four major preparation issues: night running, anchoring, the dinghy and the galley. Depart home at 5 p.m., spend the first night underway running and come to anchor somewhere the next morning. Spend that day swinging on the hook and testing all the boat’s systems independent of dock power. By sunset, get back underway and again run overnight. Return home after sunrise. Establish the watch schedule. With three watch-standers, try three hours on watch and six hours off. Write it down so everyone knows exactly who’s responsible for what and when. At least for the outside of Baja, stick to the schedule and rest when you’re off duty. A schedule that relies on people taking the helm until they’re tired and then handing control to the next person might seem like a chummy schedule, but it’s not wise for multiple days due to inequity, confusion and disharmony. The first night is usually a time for learning, especially if this is a new experience for a particular crew on a particular boat. Prepare a simple meal ahead of time. Lay your course to avoid shipping lanes and keep a simple logbook. Turn on the running lights before sunset and take a turn around the boat to make sure. To “darken ship,” turn off all the lights in the salon, galley and bridge that could possibly interfere with a watch-stander’s critical night vision on the bridge. Windshields slanted aft reflect all lights back into an operator’s eyes, so he literally can’t see past the windshield. On the radar, chartplotters and other bridge electronics, dim the screens’ brilliance controls from daytime use to nighttime. Anyone who’s not familiar with the function may need to explore unfamiliar screen menus or even read the manual. Some lights can’t be dimmed enough; for those I like to stick patches of low-tack masking tape over them. Another option is to make “quick peek flaps” out of cardboard or dish towels. At least two pairs of binoculars (7 x 50) should be within reach. If they’ve been dropped, you may need to get them re-collimated. I like image-stabilized, nightvision models with a bearing compass. Red or amber lights are best; use red nail polish to darken the lens of small flashlights. Each crew is responsible for her own amber flashlight on a lanyard. Run the generator and, if you’re in clean seas, start the water-maker. Remind the next watch to shut it off again. After daybreak, arrive at your chosen anchorage. First in deep water, run out all the rode and chain and see if it’s marked correctly. Inspect the bitter end in the chain locker. It should be made of line, so it can be severed if you ever have to cut and run. Then pick up all the ground tackle again and note how strongly or slowly the windlass hauls it in. Now pick a better spot you think will be safe for 24 hours — expect variable weather and at least one change of tide. Back down to set the anchor and secure the chain. Set up a bridle to take the strain off the windlass. A bridle also dampens chain noise for whoever sleeps in the forward cabin. 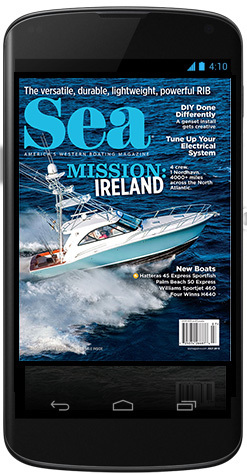 Set the GPS anchor alarm (or depthsounder) to beep if the boat drifts too close to shore. 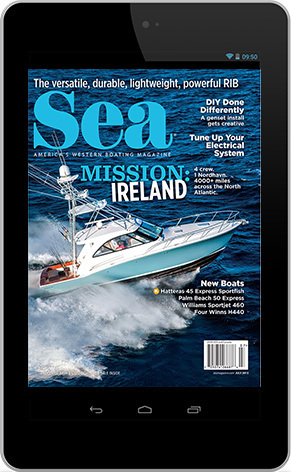 Locate your spare anchor and rode; envision setting it as a stern anchor or to kedge you offshore. After you’ve caught up on sleep, practice launching and retrieving the dinghy. 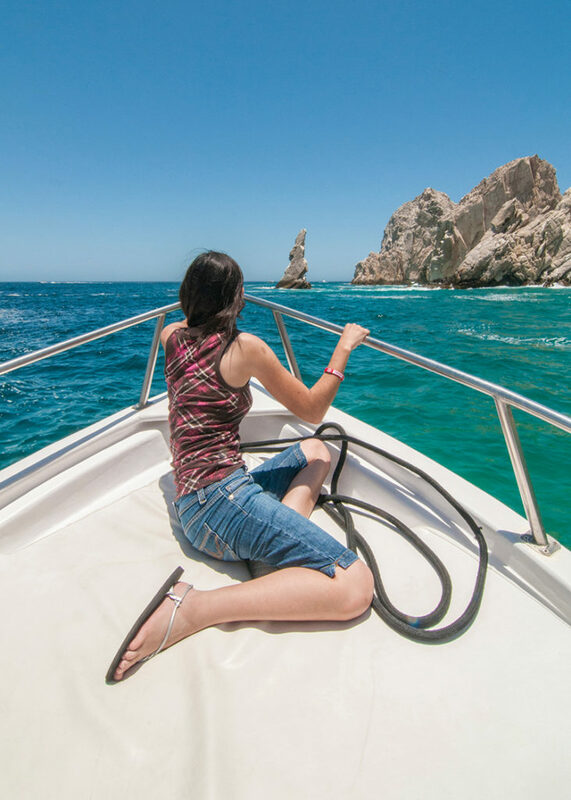 Most cruisers in Mexico say they anchor and use a dinghy more often than they use a dock. Is your davit motor or crane working properly? Motion in an anchorage exacerbates the dinghy’s tendency to swing. Does your dinghy have enough control lines, at the right lengths, to keep the motor from bashing in the windows? Does it clear all stanchions or lifelines? Imagine how you would do this with just two people. Take the dinghy for a shakedown spin. The lesson is to get it back on board before conditions get rough. If you opt to weigh anchor and get underway just before sunset, you can practice making dinner while the galley is in motion. Sea rails installed around the stovetop keep pots from sliding off, and pan paddles attached to the rails hold a pot in place on a burner. Just boiling water requires twice as large a pot, to prevent spilling. Inside the refrigerator a couple of adjustable expansion rods across the upper shelf will keep tall containers of liquid from tipping forward. An additional latch on the door may be required to keep it from flying open in heavy seas. Secure small appliances — coffee pot, thermos, toaster, electric kettle — in corners with light bungee cords, or use low-tack masking tape and larger cardboard wedges to corral bulkier countertop items such as a crock pot or electric skillet. Stow knives in a drawer, because in heavy seas, that wooden block becomes a missile launcher. Fill a cooler with drinks and ice, and secure it somewhere accessible to the crew, but not inside the galley’s limited space. In the tropics, you’ll appreciate microwave recipes, so test a few during this shakedown cruise.